Located in Pike Road, Alabama, minutes from Montgomery, The Waters is the ideal location for your next vacation rental. From a privately-owned and managed VRBO rental in The Waters, you can spend the day relaxing by the lake and enjoying one of our many amenities. 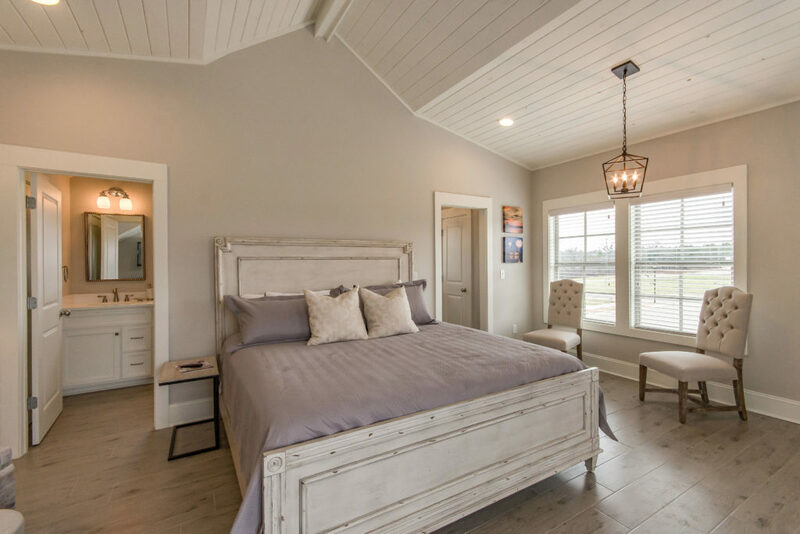 Wake up to stunning lakefront views in a beautifully crafted Southern-styled house where you feel not only at home but a part of the community. From the Lofts that sleep two to the Guesthouse that sleeps six, there is a rental to fit your needs. Experience gorgeous architecture and front porch living at its finest. All of the properties are beautifully maintained with all the comforts of home. Join your neighbors on the front porch, take a walk around the neighborhood or end the evening watching the sunset on the lake. The Chapel Hill Loft is a quaint cottage-style rental, combining both vintage and moden style for a truly unforgettable experience. The Loft is a professionally decorated studio with a private entrance, luxurious king-sized bed, and a stocked kitchenette. Both lofts comfortably sleep two, perfect for a vacationing couple or a business traveler. The Carriage House is a luxurious two-bedroom rental in a grand southern home. It has a private entrance, fully equipped kitchen, vaulted ceilings, cozy bunk room, and loft. The Guest House is the perfect rental for a family vacation or for a bridal party at The Chapel. This is a roomy cottage near the water, pool, and cafe. It’s three bedrooms and three and a half bathrooms comfortably sleeps six. The Waters provides a vacation unlike any other – a taste of home and community, the great outdoors, relaxation, fitness and more. The Waters sits on beautiful Lake Cameron, providing an excellent opportunity for fishing, boating, kayaking, and swimming. The kids will enjoy hours of splashing poolside at two zero-entry pools, the mushroom fountain or playing on the playground. For a little friendly competition, play a game of bocce, tennis, pickleball, basketball or soccer at one of our sports facilities. You can even bring your furry friend and enjoy the Bark Park! Without even leaving the neighborhood, there are activities and shopping located in the Town Center. The neighborhood fire pit provides fun for families to make s’mores or to relax with friends at the end of the day. Stop by our local businesses including H20 Cafe, Market and General Store, Cindy Barganier Interiors and Life Spring Fitness. Whether you are a business traveler or a tourist, you will find The Waters the perfect place to stay. Just minutes from Montgomery, you will have access to arts and theater, historic attractions, sporting venues and more. A short drive from Auburn University, The Waters makes a great choice for a game day getaway. The Chapel is one of the most charming wedding venues in the area. It is an idyllic spot for your special day filled with southern charm and elegance. The Waters VRBO rentals provide the ideal accommodations for the happy couple, wedding party or guests for its convenience, amenities and resort-style luxury. The Waters in Pike Road, AL, is more than a vacation rental: it’s home away from home.